I've written about running .NET Core on Raspberry Pis before, although support was initially limited. Now that Linux ARM32 is a supported distro, what else can we do? We can certainly quickly and easily install Docker on a Raspberry Pi and be running C# and .NET Core programs in minutes. We can run .NET Core in a stack of Raspberry Pis as a Kubernetes Cluster, making our own tiny cloud and install a serverless platform in it like OpenFaas! If you have a Raspberry Pi 3 with Raspbian on it like I do, check out https://dotnet.microsoft.com/download/dotnet-core/2.2 and note that last part of the URL. You can ask for /2.1, /2.0, etc, just in case you're reading this post in the future, like tomorrow. ;) Everything is always at https://dotnet.microsoft.com/download/archives so you can tell what's Current and what's not. For example, if I end up here https://dotnet.microsoft.com/download/thank-you/dotnet-sdk-2.2.102-linux-arm32-binaries I can grab the exact blob URL from the "try again" link and then wget it on my Raspberry Pi. You'll want to get a few prerequisites first. Note these blob links change when new stuff comes out, so you'll want to double check to get latest. I got the Linux ARM 32-bit SDK as well as the ASP.NET Runtime so I have those packages available for any web apps I choose to make. Then we'll extract. You can set it up as a user off of $HOME or in /opt/dotnet and then link to /usr/local/bin. Don't forget to untar the ASP.NET Runtime as well. Cool. You will want to add the PATH to your profile if you want it to survive restarts. Then run "dotnet --info" to see if it works. At this point I have BOTH the .NET Core runtime (for running stuff) as well as all the ASP.NET runtime for web apps or little microservices AND the .NET SDK which means I can actually compile code (slowly) on the Pi itself. It's up to me/you. If you aren't ever going to develop (compile code) on the Raspberry Pi, you can just install the runtime, but I think it's nice to be prepared. I am installing all this on a wonderful Raspberry Pi kit called a "CrowPi." 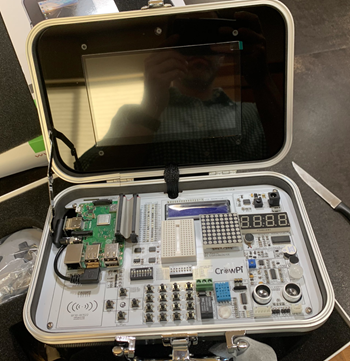 They had a successful KickStarter and are now selling a Raspberry Pi Educational Kit with an attached custom board with dozens of components. Rather than having to connect motion sensors, sound sensors, touch sensors, switches, buttons, and carry around a bunch of wires, you can experiment and play with stuff in a very organized case that also has a 7inch HDMI touch screen. They also have 21 great Python Video Courses on their YouTube Channel on how to get started with hardware. It's a joy of a device. More on that later. Now that .NET Core is installed, I can start exploring the fun happening over at https://github.com/dotnet/iot. It's filled with lots of new functionality inside of System.Device.Gpio. Remember that GPIO means "General Purpose Input/Output" which, on a Raspberry Pi, is connected to a ribbon cable on the CrowPi with lots of cool sensors ready to go! I could build my Raspberry Pi apps on my Windows/Mac/Linux machine and I'll find it much faster to compile. Then I can "scp" (secure copy) it over to the Pi. It's nice to point out that Windows 10 includes scp.exe now by default! In this example, by adding -r linux-arm I'm copying a complete self-contained app over the Pi, so don't actually need to install .NET Core like I did above. If instead, I didn't use -r (to declare a specific runtime) then I would need to make sure I've got the right versions on my dev box vs my RPi, so consider what's best for you. Here I am in my Windows machine that also has the same version of the .NET Core SDK installed. I'm in .\rpitest with a console app I made with "dotnet new console." Now I want to build and copy it over to the Pi. From the Pi, I'll need to "sudo chmod +x" the rpitest application to make sure it is executable. There's a brilliant video from Cam Soper that shows you in great detail how to run .NET Core 2.x on a Raspberry Pi and I recommend you check it out as well. IoT devices expose much more than serial ports. They typically expose multiple kinds of pins that can be programmatically used to read sensors, drive LED/LCD/eInk displays and communicate with our devices. .NET Core now has APIs for GPIO, PWM, SPI, and I²C pin types. These APIs are available via the System.Device.GPIO NuGet package. It will be supported for .NET Core 2.1 and later releases. There's some basic samples here https://github.com/dotnet/iot/blob/master/samples/README.md to start with. Most of our effort has been spent on supporting these APIs in Raspberry Pi 3. We plan to support other devices, like the Hummingboard. Please tell us which boards are important to you. We are in the process of testing Mono on the Raspberry Pi Zero. Add a reference to System.Device.Gpio or (at the time of this writing) version 0.1.0-prerelease.19065.1. Now let's do something! Here I'm just blinking this LED! Yay! Step zero works! Every cool IoT projects starts with a blinking LED! Do be aware that System.Device.Gpio is moving VERY fast and some of this code and the samples may not work if namespaces or class names change. It'll settle down soon. Great stuff though! Go get involved over at https://github.com/dotnet/iot as they are actively working on drivers/abstractions for Windows, Linux, etc and you could even submit a PR for a device like an LCD or simple sensor! I've only been playing for an hour but I will report back as I try new experiments with my kids. Love this CrowPi, saw you show it on the community stand-up. Nice looking piece of kit. So, when Core 3.0 is released I can run true winforms on the Pi, right? @Jim C. You can't run WinForms on any platform other than Windows (even with Core 3.0). You will be able to build WinForms on top of .NET Core from Core 3.0, but WinForms (and WPF) depend on Windows API's. I can see the CrowPi being used as a prop for spy or heist movies, with a custom "MovieOS" interface being shown on the screen. It's just a shame they don't ship to Canada. Any idea if there's support for the pi camera module yet? Waiting for that to hook up .net core and some of the graphical Azure cognitive services. Thanks Scott. I've wanted to get something like this going with the kids but am a bit time poor to do all the necessary stuffing around to get it right enough to get them excited. This is a huge leg up! Appreciated.... That coupon will also give me the motivation to get cracking. Doesn't look like scp supports -pw parameter for specifying password (like pscp does). Too bad Amazon doesn't ship this product outside the US. It's basically Electron powered using Dotnet Core as the back-end. Electron for information, is what Visual Studio Code is build upon. That being said, this post is awesome, and I want one kit too :). As an idea, I could build a new type of video/conference system using the led and the sensors. There is a huge security issue with .Core you probably not aware of. MS does not patch you .core any more. Not even with security problems.